The Buenos Aires nights are getting longer and the temperatures cooler. After a long, hot summer in which any Porteño with a few pesos in his pocket fled to the beach, this capital of European charm and Latin American grit is coming alive again. April ushers in fall, and with it an annual cultural rebirth. Theater, opera and ballet seasons go into full swing, and cafe life brims again with tango and billiards into the wee hours. The extravaganza goes on every night for nine months. But the nice thing about April — and May and early June — is that the days remain warm enough for visitors to walk, wearing only a light jacket or sweater, through Buenos Aires's spacious parks or to take in a Sunday afternoon at the soccer stadium. Argentines have had low spirits lately because of a deep recession. But an invigorated city government, with help from a suddenly philanthropic private sector, has done a lot to make the recession a bit easier to take. The nature reserve on the Costanera Sur has been spruced up after decades of decay, making it once again a delightful place to take a walk, bike or jog among the ducks and swans. La Boca, the barrio settled by Italians in the 19th century, has come back alive with the reopening of a museum dedicated to the marine paintings of Benito Quinquela Martín and other naturalist Argentine artists of the 20th century. And while the exact inauguration date has not been set, the Buenos Aires Museum of Latin American Art is to open in July in the Palermo district, 15 minutes by cab from downtown, with the continent's largest collection of modern paintings. Any cultural tour of Buenos Aires begins with a visit to the Colón Theater. While renowned for its acoustics and its creative blend of Italian and French architecture, it has sometimes been inconsistent in the quality of its performances. But opera, in particular, has been improving in recent years. And the expectation among critics is that this season will be the best in more than a decade. A star-studded cast of performers is scheduled to appear in the next few months, including June Anderson, Samuel Ramey and Nello Santi. The Colón Ballet Company is also taking on a fresh look with a new, Cuban-born director, Marta García. The opera company will perform Bellini's "Norma" May 11, 15, 17, 19 and 20, and Offenbach's "Tales of Hoffman" June 2, 6, 9, 10, 12 and 14. The ballet company has a mixed program, including the "Carmen Suite" with Eleonora Cassano as guest star April 21, 22, 24, 25, 28 and 29. And the Philharmonic Orchestra of Buenos Aires will perform on May 28, June 11 and June 18. Ballet tickets are $5 to $30, opera $40 to $120. Daily tours of the theater often include a backstage peek at the ballet company rehearsing. English-language tours, which cost $5, are Monday to Friday at 11 a.m. and 3 p.m., Saturday at 9, 10 and 11 a.m. and noon. For bookings, call or fax (54-11) 4378-7133, or arrive 10 minutes before the tour begins. The box office, (54-11) 4378-7344. is open 10 a.m. to 8 p.m. Tuesday to Saturday, and 10 a.m. to 5 p.m. Sunday. It is closed Monday unless there is a performance, in which case it is open from 5 p.m. until curtain time. The Web site is www.teatrocolon.org.ar. The Museum of Fine Arts, at 1473 Libertador, (54-11) 4803-8814, www .mnba.org.ar, is small by the standards of major Western cities but it has a delightful collection of French Impressionists and Modiglianis. The collection of Argentine painters depicting everyday 19th-century life is an enjoyable study of how Argentina's French and Italian cultural influences took root. Fall shows include Brazilian Baroque art from Tuesday to April 30, and one in June (dates not yet set) of Picasso and Barceló from the Reina Sofía in Madrid. Open 12:30 to 7:30 p.m. Tuesday to Friday, from 9:30 a.m. Saturday and Sunday. Free. The Modern Art Museum, 350 Avenida San Juan, (54-11) 4361-1121, has a show of works by Antonio Seguí, an Argentine painter and graphic artist who ranges from surrealism to political caricature, as well as a collection of contemporary Brazilian art through May 6. Open 10 to 8 p.m. Tuesday to Friday, 11 to 8 Saturday and Sunday. Admission is $1 (the peso is on a par with the dollar). Buenos Aires is a city for walkers. A good place to start is the Plaza de Mayo, which is the heart of the city. On one side stands the Casa Rosada, the presidential palace where Evita Perón entranced much of the country from a balcony, and on the other is the Cabildo, the old city hall and one of the capital's few surviving colonial buildings. Stretching more than a mile between the Plaza de Mayo and the monumental Congress building is the Avenida de Mayo, where a casual walk can easily turn into a daylong discovery of cafes, antique bookstores, ice cream shops, theaters and a collection of 19th- century buildings whose variety and quality compare favorably with those of Paris or Budapest. The place to stroll on a sunny Sunday is San Telmo, a barrio of narrow cobblestone streets full of tango clubs, cafes and inexpensive barbecue restaurants known as pa rrillas. The Plaza Dorrego becomes a vast flea market animated by tango musicians and dancers performing among vendors with an eclectic assortment of silver jewelry, hand-embroidered linens, and seltzer bottles and medicine jars of every imaginable color. A walk down Defensa Street is a must for antiques lovers. The shops have everything from hand-cranked phonographs to embossed gourds for drinking mate. There are many watering holes, but the best is the Plaza Dorrego Bar, Defensa 1098, where generations of port and whiskey drinkers have left the wooden walls carved with so many love messages, political diatribes and earthy vulgarities that they are now barely readable. There are many places to dance the tango, night or day, as well as to take lessons. One is the Confitería Ideal, on Suipacha 384, where Porteños come alone or in couples every afternoon and evening except Saturday, when it is closed. It's fun just to watch, and the cafeteria has some of the best coffee and pastries in town. There are classes ($5) Monday to Thursday, from noon to 3 p.m.
And of course, there is the requisite visit to Recoleta, a neighborhood 10 minutes north of downtown by cab, to see the grave of Evita Perón in the Recoleta cemetery, open daily 7 a.m. to 5:45 p.m. No need to take flowers, since the Peronist unions leave fresh bouquets every week. The 160-room Castelar Hotel and Spa, Avenida de Mayo 1152, (54-11) 4383-5008, fax (54-11) 4383-8388, www.castelarhotel.com.ar, is centrally situated near the Congress and the theater district. It has an Old World marble lobby and Turkish baths, and rooms that are comfortably furnished in a simple contemporary style. Doubles start at $120. The 147-room Hotel Dolmen, Suipacha 1079, (54-11) 4315-7117; fax (54-11) 4315-5666, www.hoteldolmen.com.ar, is a short walk from Plaza San Martín, Buenos Aires's loveliest. It is modern, well maintained and has a good Sunday breakfast buffet. Rooms are modern and functional. Doubles begin at $185. Budget: The 56-room Gran Hotel Hispano, Avenida de Mayo 861, telephone and fax (54-11) 4345-2020, is in the heart of the city and has a traditional European flavor with an interior patio graced by Spanish mosaic tiles. The rooms are small, comfortable and functional. Doubles are $53. Luxury: The 210-room Alvear Palace, Avenida Alvear 1891, (54-11) 4808-2100, fax (54-11) 4804-9246, www.alvearpalace.com, is the grande dame of Buenos Aires hotels, decorated in high French style and situated on the city's most stylish shopping avenue. All the rooms are elegant and offer fresh-cut flowers and fruit. Doubles begin at $496. The 325-room Marriott Plaza Hotel, Florida 1005, (54-11) 4318-3000, fax (54-11) 4318-3008, www.marriott.com, is a stylish hotel with vaulted ceilings in a convenient location adjacent to the shopping on Avenida Florida. Rooms are warm and homey, with lots of mahogany. The Plaza Bar is one of the most elegant places in Buenos Aires for cocktails. Doubles from $363. Argentine cuisine generally consists of steak, pasta, salad and a sweet dessert, but international fare is becoming more common. If you arrive at any restaurant before 9 p.m., you may be the only one dining; Buenos Aires only begins to come alive at 9:30 p.m.
Filo, San Martín 975; (54-11) 4311-1871, is a stylish pizzeria and Italian restaurant with a hot bar scene. The music can be loud in the front of the restaurant, but the back is comfortable and the food is quite good, starting with the antipasti. There is an extensive wine list. Dinner for two with wine, about $60. Club del Vino, Cabrera 4737, (54- 11) 4833-0050, is in Palermo Viejo, a district that is becoming trendy for sophisticated young diners. The restaurant, which consists of several simple but elegant rooms built around a courtyard, offers a menu that changes regularly — including Patagonian smoked-meat appetizers, barbecued meats and tasty pastas. The wine list includes hard- to-find Argentine selections from smaller vineyards. There are often fine tango shows on Friday and Saturday nights. Dinner for two with a nice wine goes for $80. 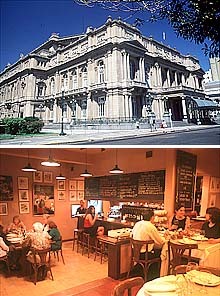 Café Tortoni, Avenida de Mayo 829, (54-11) 4342-4328, has reliable food, including steak and pizza, and excellent tango shows whose schedules vary from week to week. This is the classic Buenos Aires cafe, mixing French and Italian motifs, complete with artifacts celebrating the great tango singer Carlos Gardel and a stained-glass ceiling that is a copy from Maxim's in Paris. Dinner for two with wine or beer goes for $40. The cafe is also a good place to stop for coffee or fresh orange juice. Siga la Vaca, Avenida Alicia Moreau de Justo 1714, (54-11) 4315-6801, is one of the city's best parrillas for the price. There is an ample self- service salad bar and a barbecue pit where chefs cut enormous portions of steak and pork. Dinner for two with wine or beer at this no-frills restaurant goes for $30. Katrine, Avenida Alicia Moreau de Justo 138; (54-11) 4315-6221, is one of the stars of Puerto Madero, Buenos Aires's stylish restaurant row. The cuisine is Mediterranean, with excellent steaks and well-prepared pastas and fish, and the atmosphere is classically Continental, with outdoor tables along the water. Merluza negra, or hake, is a specialty. Dinner for two with wine, about $100. Finding a cozy tango club is as easy as strolling along virtually any street in San Telmo around Lezama Park. There are also several tango variety shows, which tend to be geared more to tourists than to Argentines. But one that appeals to both groups is Viejo Almacén, Avenida Independencia and Balcarce, (54-11) 4307-7388; www.viejo-almacen.com. ar, which serves dinner nightly at 8, followed by an excellent song and dance show at 10. Dinner with drinks and the show costs $60 a person, the show alone, $40. For a taste of Spain, there is Ávila, Avenida de Mayo 1384, (54-11) 4383- 6974, an intimate restaurant decorated with bullfight posters that serves tapas and has an entertaining flamenco show on Wednesday, Thursday, Friday and Saturday at 11 p.m. Dinner for two ranges from $50 to $70, including the show. Long tables make this a perfect place for groups, but it also has romantic Old World charm for couples. Street entertainers in San Telmo, the place to stroll on a sunny Sunday.